Brett pale ale. The BBG found this light, saisony and zesty: she couldn't quite her put finger on the flavour, but thought it would be a nice beer to drink on a summer's day. I'd suggest that you'd have to get past the weirdness of the taste before you'd consider this as a summer drink - the inability to identify its taste made it feel too much like a chemistry experiment to me, too disturbing to actually enjoy it. Plum and galangal saison. There've been lots of plum beers in the 2015 Collabfest, and for me this was the best use of the fruit so far: nicely subtle, not trying to hit you over the head with plums (ooer), and very quaffable as a result. The BBG liked the spiciness, as is her custom, finding it just restrained enough not to tip into the territory of Christmas Beer. Rambutan, Chinese pear, vanilla milk oatmeal wit. Hey, don't blame me, they've decided to use a full description for the name rather than a snarky quote from a movie. Besides, I think this is the best of the four we've got here, hugely drinkable considering its strength, featuring a massive collision of flavours with toffee winning at end. The BBG wasn't getting as much of the flavours as I was (possibly because she had a big glug of the Dog Stout below first), but she liked its drinkability. Milk stout. This was The BBG's own favourite from this session, somehow combining lightness with a proper stout taste, enhanced by the coffee on the top to ensure the lightness doesn't feel like a mistake. To me, it tasted more of coffee grounds than actual coffee, but the combination of the huge flavour and the low ABV was impressive enough. 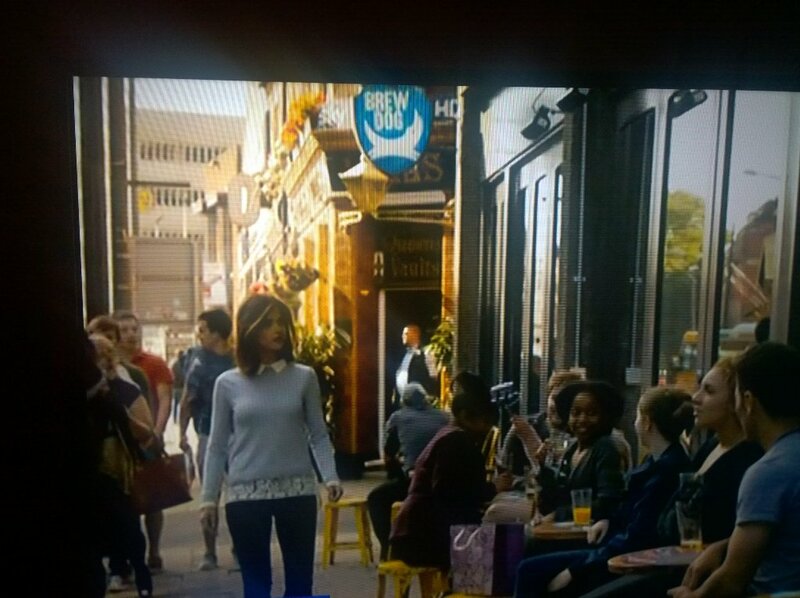 As they say on the BBC, other craft beer bars are available (though that didn't stop them using BrewDog Cardiff as a location for a Doctor Who episode around the time of our visit). In fact, there are two others just down the road from it on Westgate Street alone. Zerodegrees is more of a combination of microbrewery and restaurant, but offers a good selection of pizzas and the like that you can scoff while sitting within sight of their brewtanks. Meanwhile, Urban Tap House is the official bar of Tiny Rebel Brewing, a huge sprawling pub with loads of the brewery's beers on tap or in their splendidly designed bottles. It's also worth mentioning the nearby Hopbunker, which tries to square the circle of craft vs real ale by keeping several examples of both in cask and keg. It's a great place to go to investigate local beers you won't see anywhere else, and it seems churlish to complain that they keep them just that little bit too cold for comfort, but there you go. Meanwhile, in not-beer news: I said earlier on that we were looking for the right combination of events to trigger a visit to Cardiff, and the announcement of a gig by Everything Everything at the Student Union seemed to fit the bill for that very nicely. (Regular readers will, of course, know that an Everything Everything gig was also at the centre of the very first BrewDogging.) However, there was a catch. We were there over the weekend when most cities were having their Bonfire Night displays, and the biggest one in Wales was scheduled to kick off in the park behind Cardiff Castle just half an hour before the doors opened at the gig. So, inevitably, we decided to do both. Sparks In The Park (as they chose to call it) was a rather fine display, with plenty of visual variety and good use of music: their opening to the Star Wars theme, back in November 2015, actually started getting me a bit excited for The Force Awakens. Happily, our shoes weren't too muddy for the dancefloor at the Student Union afterwards, with Stealing Sheep proving a popular opening act for Everything Everything. Sadly, the sound was a bit ropey in parts, which reminded me why I don't go to student union gigs all that often. In terms of other things we did at the weekend, our main tourist activities were fairly obvious ones. A slow wander around Cardiff Castle's grounds and associated buildings, with the air raid shelters in the castle walls proving particularly evocative. A delightful collection of archive objects collated in the Cardiff Story exhibition, allowing you to see how the designs on the bags from Spillers Records have changed over the decades. For our Sunday morning constitutional, we took the train out to the bay area, just looking around at stuff rather than spending any money on, say, the Doctor Who exhibition. (The BBG and I played that game where you work out your Peter Capaldi name by combining the names of your favourite saint, hat and budget supermarket. I went for Paul Sombrerolidl, but she beat me effortlessly with Catherine Bowlernetto.) As for food, Crumbs do a good traditional vegetarian breakfast, Pure Kitchen do a trendier hippyish one, and Science Cream make ice cream in front of you using LIQUID FRIGGING NITROGEN. Smoked plum saison. By now we were getting a little tired of plums. The BBG was distracted by some other unfamiliar taste alongside the fruit that was hard to pin down: but to me it was pretty properly plummy, with no sourness to speak of at all. I shudder to think how many beers we're going to have to drink for Collabfest 2016.